Grass Valley, a Belden Brand, has been developing advanced IP connectivity and solutions across its entire product line, which it will be showcasing at the Las Vegas Convention Center, April 16-21, along with a range of other broadcast products in booth SL106 at NAB. 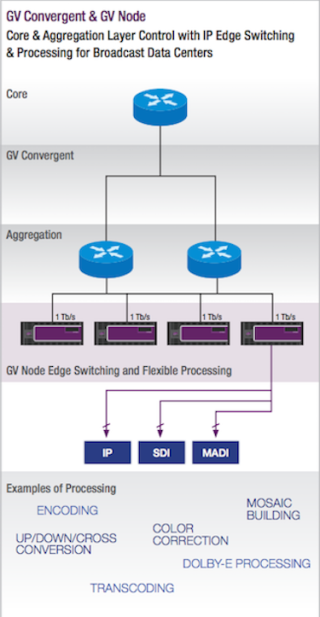 Building on the Broadcast Data Center model, Grass Valley is embracing IP in all of its products, enabling connectivity to make the movement of content more efficient. As the demands for live production continue to intensify, broadcasters will bring IP solutions into the mix while maintaining SDI capability with integration solutions such as GV Node IP processing and edge routing platform and GV Convergent IP router control and configuration system. Grass Valley is embracing open industry standards in its product development, and is one of the founding companies of AIMS, the Alliance for IP Media Solutions, an independent trade association committed to IP interoperability. In addition to IP, Grass Valley will demonstrate its latest solutions for capture, replay, switching, graphics processing, playout, and automated production. Broadcasters will see solutions that are designed to enable complete format flexibility, from HD to 4K or HDR. For those venturing into 4K production, Grass Valley’s 4K over 1-wire solution uses TICO 4:1 visually lossless compression from intoPIX to carry a signal across a single wire. “It’s important at these events to not only show off what’s new, but also to help attendees find the solutions they need today to keep their businesses running smoothly while laying the groundwork for changes that are on the horizon,” said Lopez.